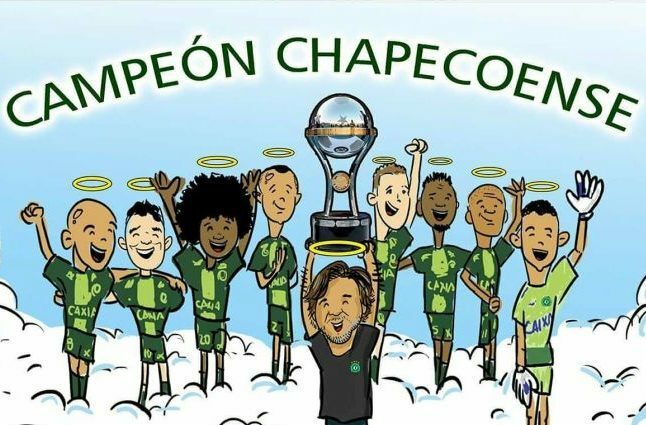 Cartoon released by Chapecoense. Credit @tumblr.com. Recently, Brazilian side Chapecoense reached the final of the Copa Sudamericana, the South American equivalent of Europe’s Europa League. Yet, the team seems now known due to the events which occurred during their travels to the final; the plane, flying to Colombia for the first leg, seemed to run out of fuel, ultimately resulting in the passing of the majority of Chapecoense’s players and staff. Yet, on request of their opposing finalists, the Brazilian club were awarded the trophy, seeming to provide the club with the silverware the players may have warranted. Additionally, the tournament prize money, combined with the offers of assistance from fellow Brazilian clubs, and veteran players, seems to ensure a rebuild may occur, whilst perhaps more pivotally showcasing the unity of the football world. En route to the final, Chapecoense bypassed multiple teams who may have been the favourites for victory, and ultimately the trophy; in their opening fixture, they faced Argentinian side, and sixteen-time league winners, Independiente, and after two 0-0 results the match went to penalties, with victory ensured after an 100% success rate from the spot. In the quarter-finals, they faced Junior and, even with the superior ranking, it was ultimately the Colombian side who ended the first leg with the advantage. Yet, a 3-0 victory in the reverse fixture seemed to enable Chapecoense to advance to the semi-finals, and it seemed to be at this stage where the team may have showcased the quality they possessed. Resolution at the back seemed to act as the catalyst in their surge to the final, and ultimately the tournament seemed to showcase their motivation to succeed, seemingly playing at the peak abilities under the manager’s philosophy. Whilst the events of the flight ultimately resulted in the passing of the majority of the club’s core, it may have highlighted the determination, and desire, of the football world to offer assistance and support. Multiple Brazilian sides seem to have offered the services of some of their players for free, with some seeming to take the initiative a step further, by requesting the maintenance of their top tier status for three seasons. Seemingly, this seems to display the unity of the Brazilian clubs, who may have put footballing rivalries aside in order to contribute to the rebuilding of the club, an act which may only result in productive consequences. Certain players, such as centre-half Neto, may be pivotal in the rebuild of the club, as these players seem to bridge the gap between the previous players and any new signings; as such, they may be able to hold on to the previous philosophy, utilised by the manager, whilst simultaneously using the former player’s legacies and traits to instigate a new beginning for the club. Yet, other clubs, and players, seem to have also joined the cause; Icelandic utility player Eidur Gudjohnsen, along with veterans Ronaldinho and Juan Riquelme, seem to have been rumoured to join, and English clubs seemingly respectfully observed a minute’s silence before each match the weekend prior. With the world seeming to unite under the circumstances, all members of the community seem to be conducting themselves with the upmost respect, although most important perhaps, may be the remembrance of the players, manager, and staff, in a productive light, as they reached the final, and ultimately ensured both they, and the club, secured a place in history. Whilst the potential result of the final may have been put into perspective, it seems clear Chapecoense’s players were motivated, and possessed a desire to succeed in the game. Additionally, the history of teams in similar situations, such as the Busby Babes in 1958, may provide the club with motivation to ensure their player’s legacies are remembered further, and act as the catalyst in rebuilding the club in their honour. Ultimately, although the event may have resulted in a lasting impact for the club, and the families of the players, the communal unity, and desire to offer vast levels of assistance from across the globe, may have surely proved football bypasses any barriers, geographically or otherwise, to support fellow players, fans, and families of the game. How may the footballing world provide assistance to the club, whilst also ensuring Chapecoense’s players are remembered?